The monastic life is centered on prayer in observing the call to prayer in the Book of Psalms: "At midnight I rise to praise you, O Lord'' and "Seven times a day I praise you.'' Monastic leaders such as St. Basil, in the fourth century; John Cassian, in the fifth century; and St. Benedict, in the sixth century, instructed that prayer be complemented by work. Thus was formulated the monastic precept ora et labora, prayer and work. in his workroom at Mount Melleray Abbey, Ireland, 1983. Roseman was invited to share in the day-to-day life in monasteries of the Benedictine, Cistercian, Trappist, and Carthusian Orders, the four monastic orders of the Western Church. In over sixty-five monasteries in the British Isles and Continental Europe, the artist created a monumental oeuvre of paintings and drawings. This unprecedented and ecumenical work, which The Los Angeles Times commends as "a sweeping artistic project,'' includes communities of monks and nuns of the Roman Catholic, Anglican, and Lutheran faiths. Roseman drew monks and nuns chanting the Psalms at the Divine Office and praying and meditating in chapel and in their cells. The artist drew in workplaces, as in the tailor shop, carpentry shop, bookbindery, and on the farm, in the garden, and in the kitchen. The Rule of St. Benedict, the basis of monastic observance in the Western Church, is a document consisting of a Prologue and seventy-three short chapters that give spiritual counsel and regulations for daily life in the monastery. "The Therapeutae, Jewish eremites contemporary with the Qumran community, are the subject of Philo of Alexandria's treatise The Contemplative Life. The Therapeutae, whose main settlement was near Alexandria, lived in solitude in hermitages and observed a regime of prayer and reading and studying the Holy Scriptures. On the Sabbath, the hermits met in a sanctuary for a sermon given by an elder. Every seven weeks, as seven was regarded as a sacred number, the hermits assembled for a discourse and common meal followed by a vigil with prayers and singing until dawn. 4. 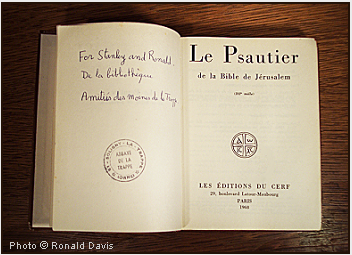 Title page of the Book of Psalms. "The desert settlement of Qumran, near the Dead Sea, was a center of monastic life in Judaism from the second century BC to the first century AD. The Dead Sea Scrolls include the Rule of the Community and accompanying texts that relate the communal life at Qumran: adherence to obedience, celibacy, and self-denial, the solemn ritual of the common meal taken in silence, the daily round of worship with the singing of the Psalms, and the lengthy vigil in the night. Roseman drew at Vigils in Benedictine, Cistercian, Trappist, and Carthusian monasteries. The artist recounts: "In my reading and study on the monastic life, I learned that the Night Office observed in monasteries today has an ancient precedent in Judeo-Christian early monastic traditions in the Middle East. The deeply felt drawing of the Carthusian monk Brother Louis at Vigils is rendered in bistre chalk on beige paper, which suggests the color of the Carthusian habit of undyed wool. Gradations of the single chalk range from fine description of the hermit's face and beard to bold strokes that describe shadows from the fall of light on the hood, shoulder and arm, and under the sleeve of the habit. 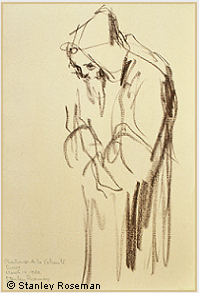 With an economy of line, Roseman has created a drawing of spiritual intensity in the depiction of the hermit monk in prayer in the night. of the Psalms in the Vulgate Bible. 2. Giorgio Vasari , Vasari on Technique, (New York: Dover Publications, Inc.), p. 205. 3. Psalm 51 in the Hebrew Bible is numbered Psalm 50 in the Vulgate. 4. Geza Vermes, The Complete Dead Sea Scrolls in English, (Harmondsworth, England: Penguin Books, 1962), The Community Rule, pp. 97-123. 5. Philo of Alexandria, The Contemplative Life and selected writings, translation by David Winston, (Paulist Press, New York, 1981), pp. 41-57. 6. The Lives of the Desert Fathers, translated by Norman Russell, (Oxford: Mowbray, and Michigan: Cistercian Studies, 1980), pp. (111, 112, 134). 7. The Rule of the Master, translated by Luke Eberle, O.S.B., (Michigan: Cistercian Publications, 1977), pp. 208, 209. 8. P. Reginald, Stift Melk, (Munich: Verlag Schnell, 1968) pp. 1,2. 10.Stanley Roseman - Dessins sur la Danse à l'Opéra de Paris (text in French and English), Bibliothèque Nationale de France, 1996, p. 12. The Rule of St. Benedict assigns great importance to lectio divina, sacred reading, and allocates a significant portion of time in the monastic schedule for reading and study. Presented below, (fig. 6), is the beautiful drawing Father Adelbert absorbed in Reading, 1978. The Dutch Benedictine monk is named after the eighth-century patron saint of St. Adelbert Abbey, located near the seacoast in North Holland. Roseman drew Father Adelbert in the library, where the artist was invited to do his own research and study. The artist writes in a text to accompany his drawings and paintings that "St. Benedict follows the earlier, sixth-century Rule of the Master that prescribes as essential to the contemplative life both manual work and sacred reading in the intervals between the hours of the Divine Office. Father Adelbert, having retired from the administrative post of novice master, had considerably more time for spiritual reading and kindly sat for the artist. 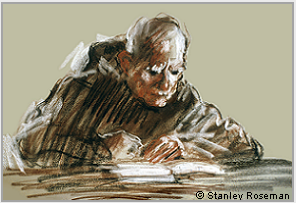 In a clear, northern light entering the library, Roseman drew in chalks with strong chiaroscuro modeling to depict the Benedictine monk seated at the reading table. The monk's black habit establishes the pyramidal composition; gray paper imparts a cool, atmospheric tonality to the drawing. White highlights illuminate the figure leaning over the table. The viewer's attention is engaged by the open book; the monk's left hand resting on a line of text; and the face of the Benedictine monk, whose eyes under bushy white eyebrows are intently fixed on a page of the book. 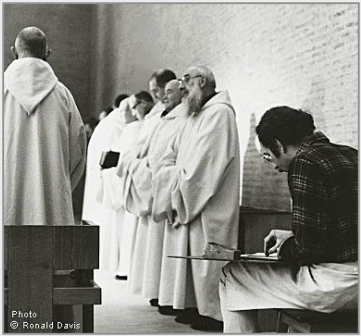 In 1978, the first year of Roseman's work on the monastic life, the artist and his colleague were cordially invited to the Trappist Abbey of St. Sixtus, founded in 1831 in the farming countryside of Western Flanders. From the collection of the Musée des Beaux-Arts, Bordeaux, is the impressive drawing A Trappist Monk at Dinner, 1978, (fig. 8). Mother Geneviève-Marie, Abbess of Echourgnac Abbey, in Aquitaine, cordially invited Roseman and Davis to the monastery in 1998. The Abbess was very appreciative of Roseman's interest in the monastic life and thoughtfully invited the artist to draw the nuns at the communal prayer in choir and at work. 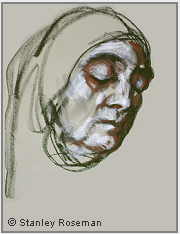 Roseman drew the figure in movement with fluent strokes of bistre and black chalks complemented by fine rendering of the nun's face as she concentrates on her task. With the combination of chalks and reserved areas of the gray paper, the artist depicts light and shade on the figure. Slightly stooped, the elderly nun wears an apron and head covering that the nuns of Echourgnac wear in the fromagerie, or cheese dairy. The Bibliothèque Nationale de France in a biographical essay on the artist commends Roseman for his "profound interest in the human condition in portraying different kinds of people, professions, social or artistic groups." Exemplary of this statement is the poignant drawing seen here of a woman of advancing years who continues to work in the monastery and to contribute to the life of the community. The monastic meal is observed with solemnity and taken in silence while a member of the Community reads aloud from an edifying book. In the present work, the pyramidal composition places the figure of Brother Pacific in the center of the page. Strong contrasts of black and white chalks depict the monk's black scapular and white tunic. The ochre paper imparts a warm tonality to the composition. The artist effectively uses white chalk to describe forms, as with the bowl and pitcher in the foreground and the monk's right hand holding a spoon; to render highlights on the elderly monk's forehead, cranium, and sleeves of his tunic; and to indicate spatial dimension. Roseman has created a striking, pictorial image of a Trappist monk at dinner. Leopold III founded several religious houses, relocated the royal residence near Vienna, and gave Melk and its properties to the monks. Over the following centuries, the Abbey flourished as a spiritual center as well as a center of learning, with the administration of a monastery school in the Benedictine tradition. Melk houses an important library containing some 80,000 volumes, 2,000 illuminated manuscripts, and 750 incunabula. The Rule of St. Benedict, Chapter 48 "The Daily Manual Labor'' instructs that work is an essential part of a life centered on prayer. Roseman drew members of monastic communities at different kinds of manual work and domestic chores. As well as drawing in those places of work mentioned above, the artist also drew in the fromagerie, as cheese production is a traditional work in Cistercian and Trappist monasteries in France. The Trappist nuns of Echourgnac Abbey continue the tradition of cheese production with the fabrication of excellent quality cheeses, a main source of income for the monastery. 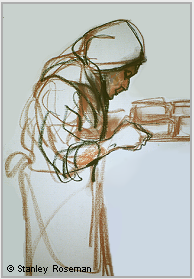 Presented here is the beautiful drawing A Trappist Nun carrying a Tray of Cheeses in the Fromagerie, (fig. 7). Roseman and Davis were welcomed by Abbot Burkhard Ellegast at Melk in the autumn of 1978. The Abbot introduced them to Brother Jonas, who gave them a tour of the monastery. The artist drew the blond-haired, bearded monk at prayer in choir and at study in his cell. The artist also drew Brother Jonas in the calefactory, (fig. 9, below), where they had coffee together after dinner and enjoyed convivial conversations about music, art, and architecture. The calefactory in medieval monasteries was one of the only rooms with a fireplace and was used as a sitting room by the community. The Los Angeles County Museum of Art conserves the excellent drawing Brother Jonas in the Calefactory, 1978, presented below, (fig. 9). The majestic Benedictine Abbey of Melk, a splendid example of Baroque architecture, stands on a high plateau overlooking the Danube. The history of the monastery dates from 1089 when the Margrave Leopold II of Austria invited a community of Benedictine monks to reside in his ancestral castle of the Babenbergs at Melk. The ruler's heir Leopold III, born at Melk in 1075, is venerated as Patron Saint of Austria and the monastery. The Musée d'Art et d'Histoire, Geneva, conserves a portrait of Brother Jonas. The drawing is presented on the website page "The Monastic Life" - Page 4 - "Across the Continent to Austria, Hungary, and Poland." Roseman recounts: "Jonas and I shared a great interest in music. It seemed especially appropriate to be sharing such an interest with him at Melk, where music has long held an important place in the life of the monastery. Brother Jonas' striking appearance in the drawing reminds one of representations of St. Leopold of Austria in illuminated manuscripts, stained-glass windows, and Renaissance paintings in which the patron saint is often depicted with blond, shoulder-length hair and full beard. In the Roseman drawing vigorous strokes of black chalk describing the Benedictine habit form a bold abstraction, complemented by detail rendering of the monk's face, hair, beard, and right hand. Black, bistre, and red chalks are augmented with white chalk adding highlights on the figure and indicating spacial dimension. Beige paper imparts a blond tonality to the composition and gives a warm sheen to the black habit. The husky, Benedictine monk is seated on a couch in the calefactory. His right arm rests on the back of the couch, and holding a cigarette, his hand falls in a relaxed manner by his side. 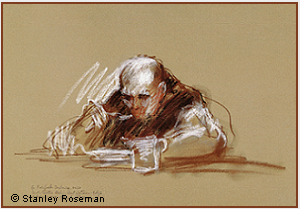 Roseman has drawn an engaging image of a young monk taking a few minutes of relaxation in the regimented daily routine of monastic life. 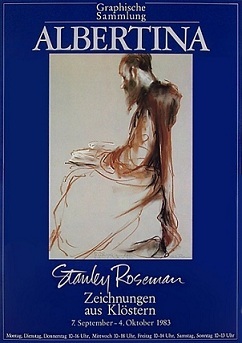 Roseman's drawings of monks at times of relaxation, as with Brother Jonas in the Calefactory, include Father Gregory at Tea, 1980, St. Augustine's Abbey, England, (Musée des-Beaux-Arts, Rouen); and also from St. Augustine's, a drawing of the elderly, bespectacled Father Paulinus smoking his pipe at tea in the common room, (Private collection, Michigan). At Tyniec Abbey in Poland, Roseman drew Brother Florian playing the Recorder, 1978, (Private collection, Switzerland). Presented here is Portrait of the Abbot of Sion. Roseman drew the Abbot in profile, head inclined and eyes lowered. Chalks of earth pigments imbue the drawing with a warm tonality. Black chalk delineates the fringe of hair, complemented by white highlights on the monk's face and cranium. 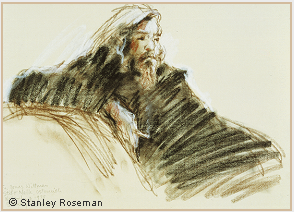 Roseman has drawn a deeply felt portrait of a man dedicated to the contemplative life. Presented here is the beautiful portrait drawing Sister Paola at Vespers, (fig. 11). With a harmony of fluent lines describing the veil and fine chiaroscuro modeling of the face of the Benedictine nun, Roseman eloquently conveys the inner calm of a middle-aged woman devoted to the contemplative life. my God; in him I will trust.' "
Sion Abbey is a Dutch Trappist monastery founded in 1833 in Diepenveen, in the eastern province of Overijssel. Abbot Adolfus van der Zeijden was introduced to Roseman's work by Abbot Gerard Mathijsen, Abbot of St. Adelbert. Abbot Gerard, a long-time friend of the artist and his colleague, had graciously received them on a number of sojourns at the monastery over the years. Abbot Adolfus cordially invited Roseman and Davis to Sion Abbey and welcomed them warmly. Greatly encouraging to the artist, the Abbot told Roseman that his work brings an awareness of contemplative life in the modern age and fosters understanding and ecumenicism between people of the Jewish and Christian faiths. The nuns of Casa Emmaus, in Tuscany, are members of the Camaldolese Congregation of the Order of St. Benedict, which evolved from the ascetic ideals of the eleventh-century reformer St. Romuald, founder of the Hermitage and Monastery of Camaldoli in the Apennines. 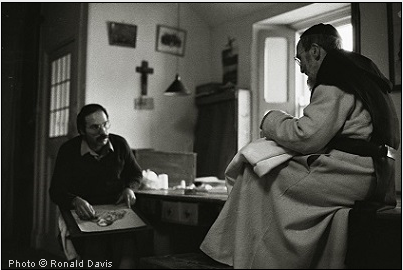 Roseman began the second year of his work on the monastic life at Camaldoli in January of 1979, and he and Davis returned to Camaldoli in the summer of 1998. That summer, the Prioress Mother Domenica cordially invited them to Casa Emmaus. Roseman drew at communal meals in the refectory and at afternoon tea or coffee in the calefactory. The artist drew individuals writing in the scriptorium and reading and studying in the library. 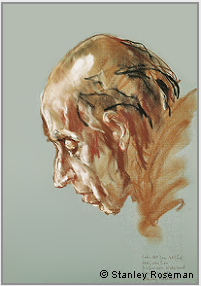 At St. Adelbert Abbey, in the Netherlands, the artist drew Brother Thijs in the Library, 1982, acquired by the Graphische Sammlung Albertina, Vienna, which houses a renowned collection of master drawings. The Abbey of La Trappe, in Normandy, was a center of reform in the Cistercian Order in the seventeenth century. The reform gave rise to the Order of Cistercians of the Strict Observance, also known as the Trappist Order. The warm welcome and gracious hospitality Roseman and Davis received from Abbot Gérard Dubois and the Community in June 1979 was the beginning of a long and creative association with the monastery. Frère Samuel shared a friendship with the artist and his colleague from their first sojourn at La Trappe. The Trappist monk was then the manager of the Abbey's dairy farm. Farming has been a traditional occupation in Cistercian monasteries since the beginning of the Order in the closing years of the eleventh century. The farm at La Trappe, with over a hundred dairy cows, provided the monastery with its main source of income. Frère Samuel at Compline, (fig. 12), is an impressive work from Roseman and Davis' return to La Trappe in 2002. With sculptural modeling in a combination of chalks, the artist renders the monk's face with white highlights on the brow, cheeks, and nose; passages of white on the hair and beard; complemented by warm shading in red and bistre chalks. 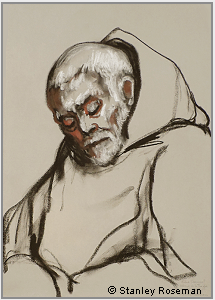 Strong, linear description in black chalk defines Frère Samuel's cowl and hood, which rests on the monk's shoulders as he sits in choir, his head lowered in prayer. Roseman has drawn a deeply moving portrait of a man of advancing years in prayerful communion with God.